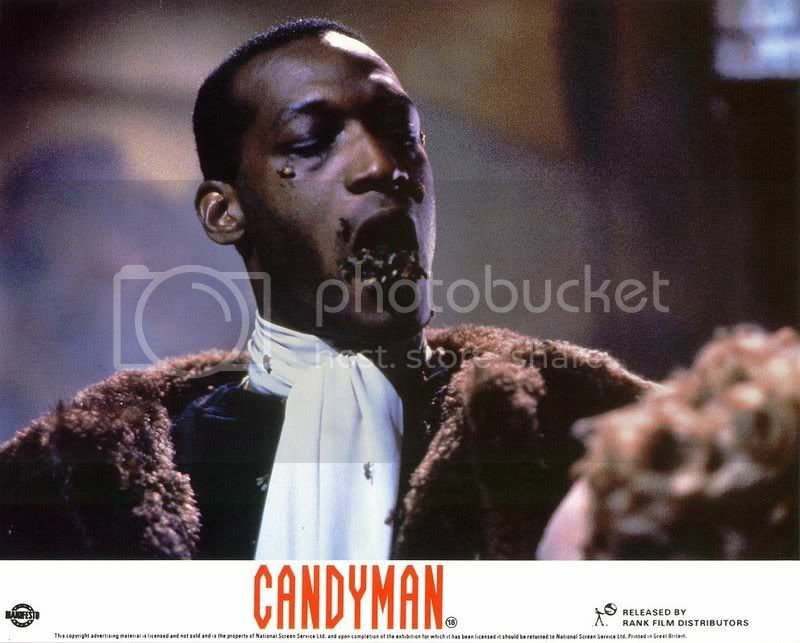 Candyman is Clive Barker's second most famous creation, trailing only behind Hellraiser's Pinhead in notoriety. Ironically, Candyman only appears on a few pages of Barker's work. By the time he was writing the final three of the six-volume Books of Blood, from whose fourth volume (published in the U.S. as In the Flesh) "The Forbidden" is culled, Barker was moving away from his splatterpunk origins. As such, the story primarily focuses on urban myth and the power of belief. The heroine is even a semiotician named Helen (ain't that a name full of meaning). Around Guy Fawkes' Day, Helen begins searching the Spector Street (get it) housing developments for material on a thesis about graffiti. What she finds are tales of a hook-handed maniac on the prowl. In true horror narrative style, the inhabitants of the project are wary of talking about things, but they tell Helen just enough to get her and them in trouble. A baby is found murdered and Helen's suspicious. Of course it was done by Candyman, resident malevolent spirit, to both punish the locals for their loose lips and to reinforce his legend (the source of his immortality). He catches Helen, and he, she, and the baby all go up in a Guy Fawkes bonfire. Now Helen has entered the urban English pantheon of Fawkes and Candyman. All told, "The Forbidden" is a reliable and smart little terror tale. It may even be too smart for its own good. Scratching the surface of Barker's immaculate prose reveals a world of possible pretensions, as if Barker is screaming, "Take me seriously. Look, I'm educated and ever so good with your trendy po-mo meta-fictional concepts. Just ignore the dead baby over there, eh what?" I remember reading the story in high school, during the bloom of my Barker infatuation, and being knocked off my feet. A degree in English later and I find all the throwaway semiotics to be a bit of a drag on an otherwise taught little suspense yarn. Writer/director Rose pumps some necessary blood into the Candyman tale, keeping the meta but adding a bit more meat. The location is shifted to Chicago's infamous Cabrini Green housing project. Helen is a UIUC student researching urban legends. Of course she's stupid enough to go to the Green and pursue Candyman. Alongside the monster, Helen finds Candyman's backstory. Seems he was a slave's son who was murdered on the lot upon which Cabrini Green would be built. He had been with a white woman. Taking a cue from any number of Universal mummy films, Rose makes Helen the reincarnation of the aforementioned white woman. Bloody mayhem ensues. We get some pretty decent gore effects and some great aftermath shots. Despite the carnage, Rose keeps things posh enough to skirt being a grindhouse production. He even throws in a genuinely chilling Philip Glass score---beats "Tubular Bells" any day of the week. Since this is a class act, we don't get a dead baby, just a dead Helen. While "The Forbidden" allows Candyman to regain his status as urban legend, in Candyman Helen usurps his claim to deity, herself becoming Chicago's ghoul du jour. Both versions of the tale are worth checking out. Barker is a master craftsman of words. Even as its most gut-wrenching, his prose reads with the assurance and determination that is rare in contemporary literature, much less in the dark fantasy/horror genre. The movie matches Barker's text with the same level of visual skill. You may even be a little timid about saying Candyman in the mirror five times.